Please take a moment to read our update for April 2019. 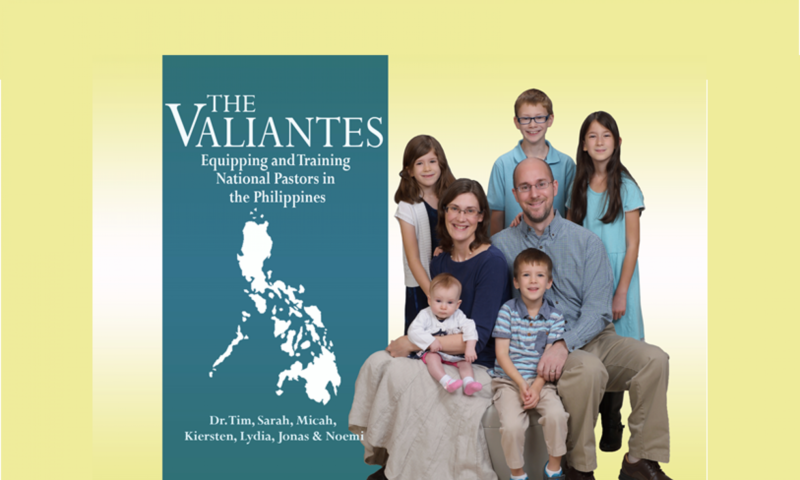 Less than 1 month before we leave for the Philippines! You can read about the flurry of activity in our home in our latest update. Please take a moment to read our update for March 2019. We are inching closer to our May 15 departure for the Philippines. This has been a profitable month in getting details arranged for the upcoming transition. Thanks for your continued prayers! Please take a moment to read our update for February 2019. We are excited to reach 100% of our support goal, and to make strides toward our departure for the Philippines. Please take a moment to read our update for January 2019. This update tells of our trip back East, and some exciting developments over the past month! Please take a moment to read our update for December 2018. This update gives some highlights from the past year, as well as the past month! We have clearly seen God’s goodness and grace! As a father, my ultimate desire is for my children to know, love, and serve God. If I can live out Deuteronomy 6 (personally instructing them in every circumstance of life), and in turn allow the Holy Spirit to cultivate in their hearts a deep love for His Word, then I will consider my life’s work as a father a success. Near the start of 2018, our older two children made it their goal to read through the entire Bible. In the mornings (more often than not), I would find them sitting in a quiet place with the pages of their Bibles opened. Today, after many months of consistently studying Scripture they both achieved their goal. They finished reading the Bible from cover to cover. Needless to say, I am one super-proud daddy. In Deuteronomy 8 (just two chapters following God’s command in Deuteronomy 6:6 for His Word to be in our hearts), God speaks to Moses and reminds him to observe to do all of the commandments He commanded Him (8:1). And to help illustrate man’s desperate need for the Word, God uses something Moses was all too familiar with–a shortage of food. One of the common troubles Israel faced while wandering in the wilderness was a lack of food. Of course, this makes perfect sense when you understand that the wilderness Israel wandered through was a desert. We have seen a lot of “desert” in our travels out West. Without moisture, there is no prospect of food. Without rain, the ground is dry and barren and incapable of supporting life. This makes what God did in providing for His people for 40 years all the more amazing. And when you consider the fact that God supported 2-3 million people for those years, it is mind blowing. In verse 3 God reminds Moses of how He humbled him, and caused him to suffer hunger during those wilderness wanderings. This was something Moses would have been painfully aware of. But what is interesting is that in the latter part of verse 3, God gives Moses the reason He allowed His people to face these afflictions. God says He permitted them to suffer hunger physically so that they would understand a spiritual truth. (It is amazing how often God touches our physical lives to communicate a spiritual need we have). But in this particular instance, the spiritual truth God communicated was that man does not live by bread alone, but by every word that proceeds out of the mouth of God. What a powerful reminder. Though we live in a bountiful land where most do not go to bed hungry, this statement still rings true. God’s Word is the nourishment that feeds us spiritually. Bread may keep our bodies alive, yet it is the Word of God that feeds our souls. And so, we are met with the questions: Am I taking time to nourish my soul on the Word of God? Am I daily taking sustenance from God’s Word? If not, now is a great time to begin making the Bible the priority God intends for it to be in your life.